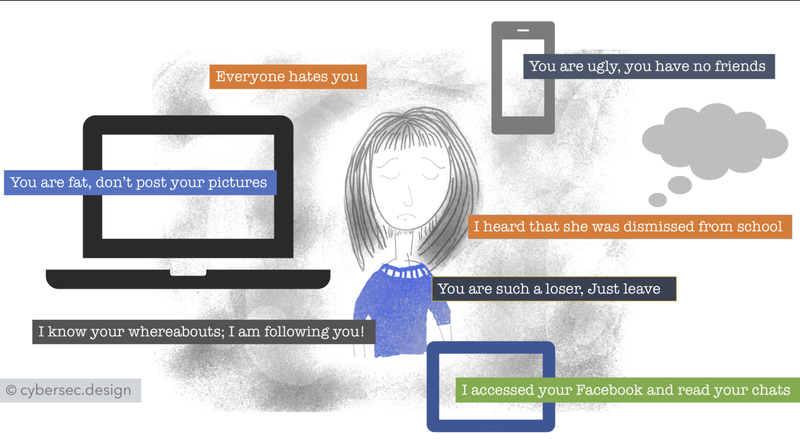 Cyberbullying is nothing much but bullying done using technology — emails, social media, text messages, stalking etc. It can be in different subtle forms like invalid criticisms, exclusion, warnings etc. What’s even worse is it hits you really hard in your mind and makes you feel guilty as if it is your fault. People often feel embarrassed and start to stay away from others with the fear of being rejected by their friends and other groups. This brings in depression and a feel of being unsafe to go to school or work. Although this can happen anywhere, its more prevalent at schools. It makes a kid feel hopeless and stuck as if there is nothing he/she can do to stop it. What Impact does it cause? Cyberbullying does hurt someone just as much as physical or verbal bullying because it spreads quickly and can be hard to escape. Thanks to Social media, the content can be shared with a lot of people. Psychologically, it becomes hard for the people to ignore if you’re use technology too often. The bully can stay anonymous for a long time as he/she creates fake profiles or names to spread or create. And often it isn’t just one person, there can be a lot of people who take part of it. Further removing the traces of it can be a very difficult process. It is important to address this problem as Experts say, the kids who are bullied and the bullies themselves are at a higher risk for suicidal thoughts, attempts and completed suicides. What qualifies to be cyberbullying? What to do if you’re getting bullied? There are few things you need to remember if you’re being bullied. First of all, it is not your fault and you’re not alone. There is help available and you won’t be considered weak if you seek for it. You need to build your confidence up to get through this and there are several things you can do. If you know the person who is bullying, tell him/her that it’s not okay and its bothering you. Block and report the person/profile/post on Social Media. There are dedicated teams who work in these companies to work on activities like this and they do take it seriously. If you’re scared to report about this. There are many channels where you can report issues like this anonymously. Many a times in panic and the fear of being embarrassed, one ends up deleting these emails or messages. It’s important to keep evidence, save the emails and take screenshots. This will be helpful when you want to report the incident to your teacher/supervisor. Or sometimes, when you get help from the police. The anxiety of the rumor being spread will make you feel even more scared and be diligent on social media to watch out for every update; just to see if there is something about you. This is when you should probably switch off for a while and do something else that brings you happiness and gives confidence and strength. Maybe pick your sketching hobby or music or even a game of cricket. It can be anything but your computer! Many parents fail to understand if their kids are undergoing this in school. Even if they talk, the kids may not get this direct term. It is very hard to understand their terms that they use for it. Further, because many kids are reluctant to report, it is very hard to know If they are getting bullied. See if your kid feels very upset during or after using internet; is being very secretive of his/her digital life. Observe if there is a change in mood, behavior or sleep patterns. He/she wants to stop using the computer or phone. ..or even when they avoid discussions on social and technology. Kids do not express this mostly because they feel ashamed of the stigma or fear that their computer or smartphone privileges will be taken away. Now when your kid comes up to talk to you, don’t get anxious and want to solve the problem right away. Appreciate them for approaching you and respond thoughtfully. Explain them that, they aren’t alone, and it is not their fault. Identify a good plan on what can make your kid comfortable. Ensure the school your kid goes has a strong policy and practices against bullying. There should be notice boards warning students from involving in bullying or ragging. The school should believe in solutions than punishments. It is important to keep the computer in a public place in the home to observe patterns in their behavior. Sometimes you have options to turn off messaging services or applications or enable parental controls on the computer. Build a comfort zone with your kids so that, they add you up as a friend on their social profiles. That way, it is good to keep a watch on their activities. However, please do not comment or post anything to their profile which they might find it weird among their friends. 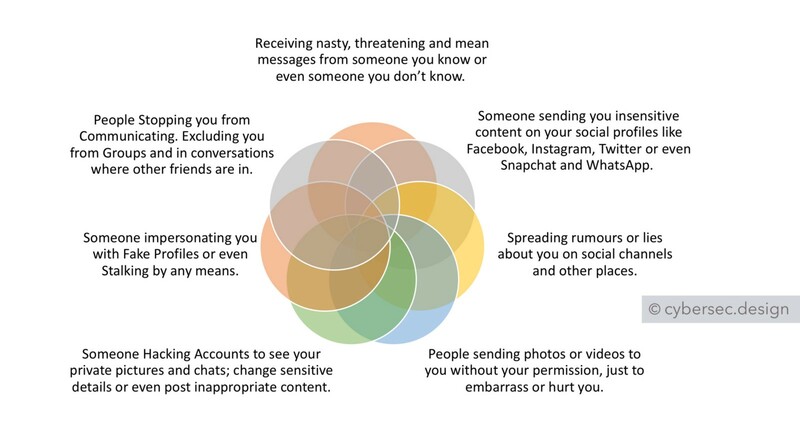 Talk to your kid about the importance of Privacy and why it is not a good idea to share personal information and whereabouts to your social profile. Ensure their accounts has the right protection and settings enabled. Sometimes It is very important to ask your kids on how their day at school was. When they speak to you about any of these incidents as a part of the day, listen to understand what they speak and show that you are interested to know the details. Assure them that, it is okay to support the person who is getting bullied. Ask your kid to be friend with him/her — sit along or even hangout together. A little bit of comfort will definitely make the other person feel better. Often there is a sense of insecurity, jealousy, competition that causes children to hate others and vent their anger either directly or through bullying anonymously. It’s very important to address that fact; you can’t avoid it and expect it to get better on time. As a parent we need to govern the behavior and not the individual. As a first step, speak to your kid firmly on how his/her actions bring out the negative impact on others. Cyberbullying also can happen accidentally. The nature of text, messages or emails make it very hard to detect the sender’s tone. However, one person’s joke could be another person’s insult. Talk to your kid and explain about your insecurities and how did you overcome it in the past. It could also help if you quote any examples on how you were jealous about a school mate and how you changed the perspectives, that whatever he/she did at school didn’t matter to you as an individual. Avoid comparisons. Highlight the strengths of your kid. Speak to him on how he can be different and better and not just be jealous about others in the class. Teach him on how he can use his strengths to make friends and connect to the people. Encourage your kid to be authentic with his friends. Your kid doesn’t need to win or be first in the class always. It is good to acknowledge the strength of others and appreciate them. If your kid has trouble understanding and has anger management issues, seek a professional help. This will not just help him/her manage this behavior but also give confidence and better social skills. Set Parental Controls on devices when needed. Summing up, as a parent, we may need to pay attention to our behavior as well. We need to model good habits to help kids understand the benefits and dangers of being on Technology. Most importantly, teach them how can they be great at what they do and still have great set of friends; and of course, how to make the best use of tech for themselves.